Designed to meet the highest standards of guitar and bass compression. Hand-made in Finland premium quality design phaser pedal. 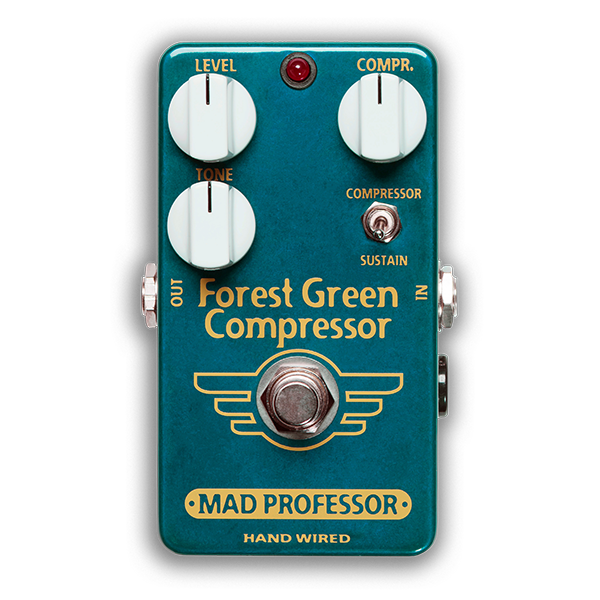 Forest Green Compressor (FGC) is designed to meet the highest standards of guitar and bass compression.There is extremely low noise throughout the range and a high overload margin, which allows also a wide dynamic input range at minimum distortion and noise. FGC is equipped with a special tone control to fine-tune the compressed sound for most transparent tone and effect. The pedal has a switchable compressor and sustainer mode. In Sustain mode, you can get a very dynamic, touch-sensitive tone with a long sustain. Here the attack is not lost, making the pedal suit-able even for blues players and works great with slide playing. Like all Hand Wired MP pedals, FGC is hand made in Finland using only premium components, to give years of trouble free operation with superb musical tone.